Perch is zigzagged as shown in the picture. 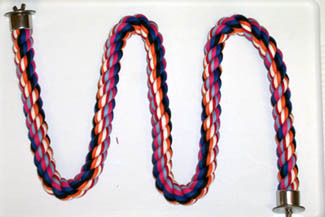 The diameter is the width of the cotton rope and the length is measured when the rope is extended. Offer Twister Perches for more stimulation in your bird's environment. Soothing and comfortable to sit on, these perches are versatile additions inside or outside of your bird's cage.